Installation shot of work by Jessie Flood-Paddock in Refinding: Jessie Flood-Paddock with Kenneth Armitage, at The Tetley, Leeds 2017. Courtesy private collection, Carl Freedman Gallery London and the artist. Photo: Michael Pollard. 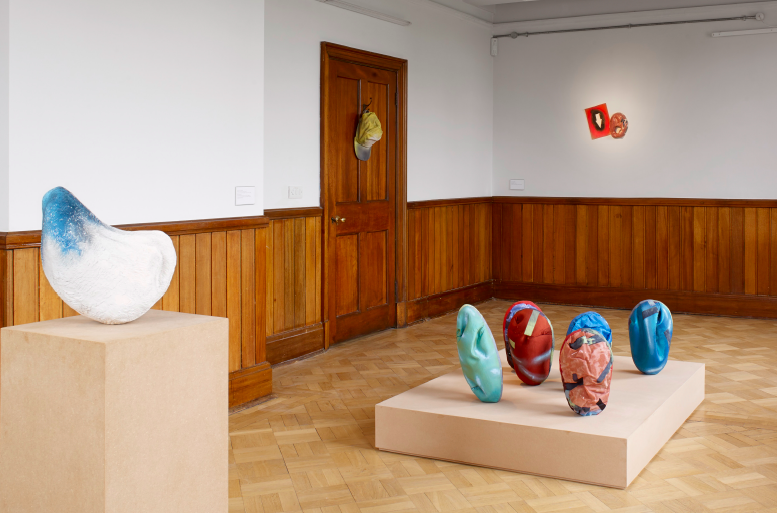 The expansive yet self-contained space of The Tetley lends itself well to this thoughtful and moving exhibition of the work of Jessie Flood-Paddock and Kenneth Armitage. Recipient of the Kenneth Armitage fellowship in 2013, Flood-Paddock spent the following two years in Armitage’s studio. She has responded to, or rather with, his ‘Oak Tree’ series, a collection of prints, drawings, etchings and sculptures. Alongside this we see Flood-Paddock’s newer pieces including ‘Lion Vasa’, a jute lion rampant in the atrium which she describes as ‘hand-sewn, big sculpture’. This huge but fragile construction – based on the figurehead of a seventeenth century ship that sank on its maiden voyage – rears up in the space also populated by carbon-fibre shield maquettes and an unsettling hanging rope. The homeliness of the materials hint at something darker underneath. Around this space are nine rooms, or galleries, that alternate between the work of the two artists. Each gallery is self-contained, yet in dialogue with the others. Armitage’s rooms have pale blinds pulled down, whilst in Flood-Paddock’s they remain half-open to reveal what was an unusually bright and lovely Leeds morning. Armitage’s depictions of oak trees are mostly from his time spent in Richmond Park, but he had his roots in Leeds. In gallery one we see Armitage’s sculptures with half-tentative, half-assertive branches alongside his tree drawings, presented either singly, in clusters or en masse. In gallery two are blue moulded rubber forearms by Flood-Paddock and her more provocative, assertive sculpture, ‘Snacks’, based on fast food in packets and containing within their marks and lines something that resembles faces. In gallery three, ‘Tall Oak Trunk’ (1980) and a series of six etchings reintroduce us once again to Armitage’s trees. Like patient sitters they can be viewed as both objects and something more than that. In gallery four, Flood-Paddock’s ‘Snacks’ emerge again, in tie-dyed and spray painted cotton and silk, alongside ‘Oyster Standing’ and in discourse with Flood-Paddock’s studio assistant Milly Peck’s ‘In the gutter’ with rich and earthy bricks. Galleries five and six display Armitage’s respectful and observant landscape of oak trees. Each one is a sculptural form, a haven for wildlife, a captive of civilisation in a well-tended park, and an individual in its own right. They grow and die, splitting and returning, quite unbothered by the passing of human traffic and the seasons. In gallery seven, Flood-Paddock’s hand-painted bronze cyan nudes nestle alongside Armitage’s small oak tree maquette, enjoying a conversation now that they are released from the tyranny of chronological time. In gallery eight, Flood-Paddock’s ‘Snacks Standing’, carved from American white ash and black walnut, converse with the warm, autumnal oranges and greens of Armitage’s sculptures, prints, and drawings of gallery nine. The rhizomic nature of this exhibition, allowing the interpretation and response of Flood-Paddock and Armitage’s work alongside each other, shows us contemporaneous worlds. These worlds exists within and of each other and – by doing so – are elegantly making multiple meanings and insistent re findings. Refinding, The Tetley 6 May – 20 July 2017.